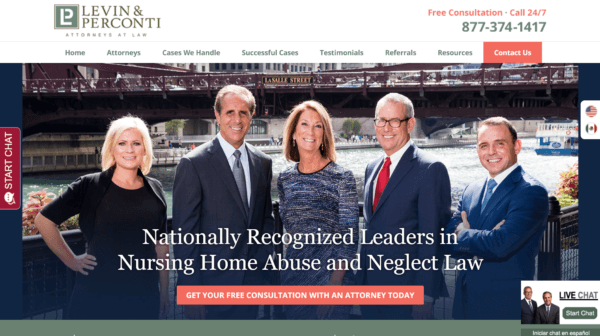 Review of the Top 100 Chicago Law Firm Website Homepage Designs 2019 | FRETZIN, INC.
At a recent lawyers’ luncheon, one of the attendees mentioned that his firm struggled with what imagery they should use for their law firm website homepage design. This is not the first time this issue has come up and it is a common conundrum for large and small law firms alike. This was in fact a topic I was pondering long before I sat down with this group of attorneys. So, we at FRETZIN, Inc. did an analysis of the top 100 Chicago law firm website homepage designs. The results were interesting and both expected and unexpected. We do not “judge” any of the websites. In fact, as long as the site has a responsive website design, the site is engaging and it uses imagery and messaging effectively, there is a significant likelihood that it will demonstrate the ‘level of professionalism’ of your firm thus encouraging website visitors to take the next step. For more information regarding how you can improve your law firm homepage design, contact FRETZIN, Inc. Director of Marketing Barry Zlotowicz, for a free consultation at 312-981-0119. The law firms reviewed were selected from a third-party source’s list of the “top 100 Chicago law firms” based on number of employees in Chicago. All firms had a minimum of forty employees. As such, these firms likely had sizeable marketing budgets. However, the more money a firm dedicates toward marketing does not necessarily result in a better law firm website homepage design. Law firms with larger budgets often hire branding or marketing agencies to develop their brand/message. 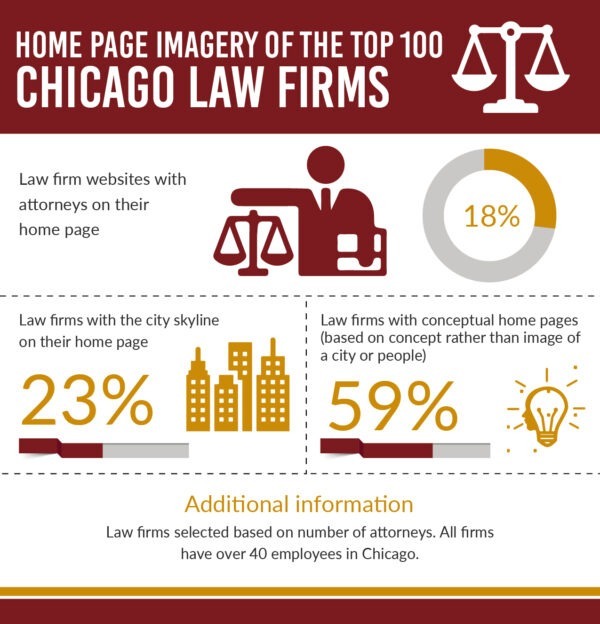 As such, it’s not surprising that the majority of the top Chicago law firms (59%) utilized conceptual home pages. An interesting conceptual homepage design is found on the Vedder Price website. Vedder uses extensive imagery including six conceptual photos blended in with large “V’s” as you scroll down the homepage. Katherine Miletich, Chief Marketing Officer, Vedder Price P.C. The city skyline is a standard law firm website design, along with a gavel and stacks of law books. As such, it’s not surprising that nearly a quarter of Chicago law firms used images of a city prominently on their homepage. These types of photographs provide great geographic context for your firm – the Chicago river, the Wrigley building or the Willis Tower for example, are Chicago landmarks and represent that your firm is a local law firm. However, this imagery is a bit passé and says very little about a law firm. Especially compared to a conceptual design or a firm that showcases its’ attorneys prominently. A good homepage design is an opportunity to differentiate your law firm. Take advantage of it. The more attorneys a firm has the harder it is to feature them prominently. An example of a tastefully developed home page with attorney imagery is Levin & Perconti. 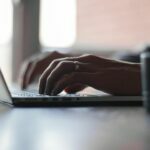 Some attorney marketing experts discourage their clients from putting lawyers on their homepage. 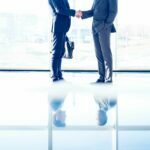 They argue that by featuring attorneys prominently, you lose the opportunity to differentiate your firm. Per Eric above, it builds trust with the people a prospective client is contacting. Obtaining and retaining clients is about relationships. 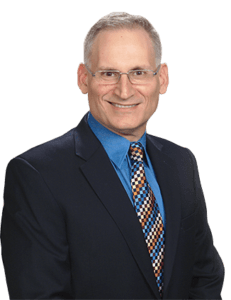 Using attorney photos has drawbacks as well, especially for small law firms. As a former solo attorney, I was interested in branding myself personally with my photo on the home page of my website. However, on at least two occasions, I lost clients who saw that I was a solo attorney and wanted a larger firm to handle his/her case. The fact of the matter is that there is no one “right way” to develop an effective homepage. There are many factors that may affect your decision about your homepage design. What is right for your firm is not going to be right for another firm. The first question you should ask yourself is, what impression do you want to make when someone lands on your homepage? Once you answer this all-important question, figure out a way to utilize imagery (concept, attorneys or cityscapes) to accomplish your goal. And match your messaging to your imagery. What is the single most important thing you want to communicate to your visitors when they land on your site? Michael C. James, Director of Marketing, Much Shelist, P.C. Much Shelist uses a “slider” or rotating images in their homepage imagery. Some designers like sliders and some do not. The first image is conceptual while the second image is of many Much attorneys which highlights Much’s ethnic and gender diversity. This is a nice balance of homepage imagery. What type of law firm do you have? Often when I meet with firms, they will say that they don’t want a “personal-injury-like” website. Meaning, they don’t want huge verdicts, repeated “calls to action” or live chat functionality on their site. Every law firm and lawyer are different. What you choose may be dependent upon what type of law you practice, the personality of your management team, how big or small your firm is, and countless other factors that might influence your decision about what imagery you use. Where Should Imagery Be Located on Your Website? Most websites place important imagery “above the fold.” This is a phrase that originally applied to print newspapers – the image was literally above the fold in the paper. Regarding website homepage design, it generally means in the upper half of the website and thus visible when you first visit the site. If you search on Google to determine whether a good homepage design should have imagery and messaging above the fold, you will find countless divergent viewpoints. I believe that the messaging and imagery should be prominently placed above the fold. I want someone who visits one of my sites to know immediately upon arrival where they are. It is too easy for a visitor to leave your site if they don’t believe they’re on the correct site for them. What about the rest of your website? Once a visitor lands on your site, analyzes your imagery and messaging, they begin to scroll down your site, especially when they’re on their mobile phone. As such, it’s important that your entire site corresponds with your website concept. Reinforce your messaging when possible and make it consistent throughout your site. In fact, always ensure that your messaging and brand is consistent across all your marketing channels. The colors you select for your website are important as well. There have been exhaustive studies on the psychological effects of color in marketing. This extends far beyond what primary, secondary or tertiary colors you choose. It also applies to what message you are trying to convey and how to use contrasting colors to get website visitors to contact your firm. Again, your visitors are going to make split second decisions about your firm based on what they see on your website – so choose your color wisely. There are many “web-dev 101” items that are essential in creating an effective law firm website homepage design. Many more than discussed in this article. 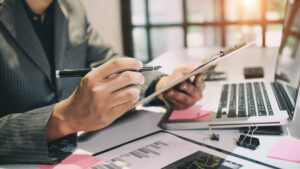 However, the single most important factor in designing your website is to ensure that your website accurately reflects the level of professionalism of your firm. If it doesn’t, you may be failing to convert countless website visitors or help you in building the strongest brand possible. Previous Post Repost: Staying ahead of the game, growing a legal practice efficiently and ethically in 2019 Next Post Crazy Times. 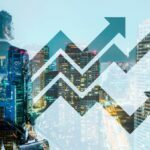 Is it Time to Recession-Proof Your Law Practice?